It’s days like these when you need trusty recipes. I don’t have it in me at the moment to create from scratch so I took an Almond Meringue recipe from Nick Malgieri (Perfect Cakes). He pairs it with a chocolate filling and fresh raspberries. I use my Dulce de Leche as the filling, which ends up making this recipe about half the work and about half the cost (maybe even less). These meringue sandwich cookies have an airy light texture that collapses into the center where it gets a little gooey and sticky, much like French macaroons. They are quite sweet and pair amazingly well with coffee. 1. Preheat the oven to 300 degrees F and set racks in thirds in the oven. Cover 3 sheet pans with parchment paper. Set aside. 2. 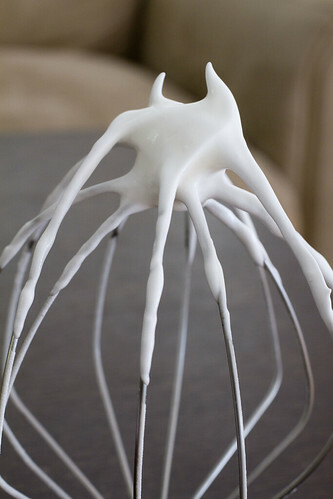 Beat the egg whites and salt in a mixer with the whisk attachment, on medium speed, until white and opaque. 3. 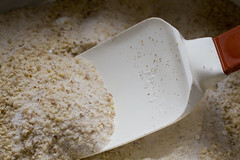 Increase the speed to high and pour 1/2 cup sugar in, in a steady stream. Beat until whites are very firm but not dry. 4. 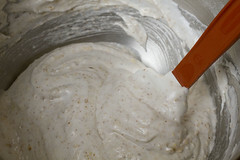 In a medium bowl, combine the remaining 1/2 cup sugar with the almonds and cornstarch. Fold it into the egg whites. 5. Using a pastry bag with a round 3/8″ tip, pipe about 2″ long fingers. You should get about 84. 6. Bake for about 15 minutes, rotating and turning the trays in the middle. Watch them carefully to see when they are lightly golden and fairly dry (I have to eat one to tell). Cool on a drying rack. 7. 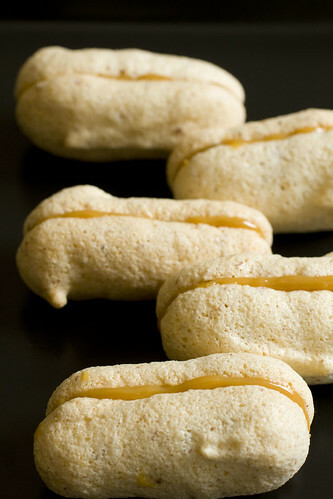 Once the meringues are cool, you can sandwich a thin layer of Dulce de Leche between 2 meringues. 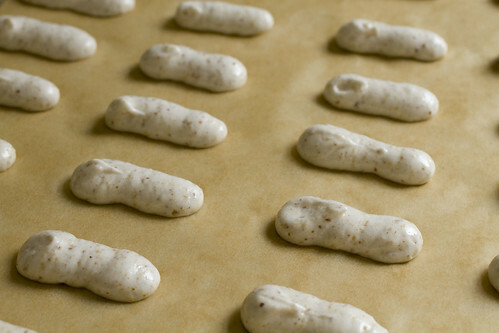 Store the meringues in a cool room temperature if you are serving that day. Store in an airtight container in the fridge to keep longer. posted by jessica	at 12:16 PM	Filed under Desserts, Recipes. You can follow any responses to this entry through the RSS 2.0 feed. Both comments and pings are currently closed. These are like macarons! Great use of dulce de leche. These are adorable. I like the size of them! So many times, cookies are too big for my taste, but these are tiny and the dulce de leche filling sounds great! Nice reuse of an ingredient! this would be great over ice-cream or even as cupcake frosting! How about adding a chocolate element to it. Would it work?? 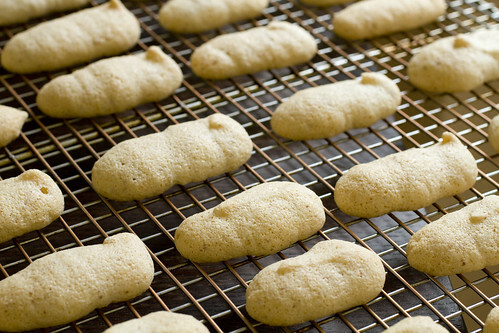 cloud-like cookies and creamy, caramelly filling–what a magnificent combination. 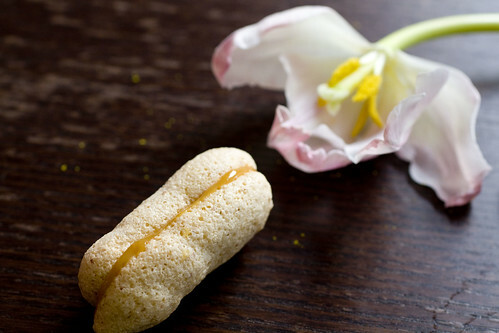 wonderful use for your dulce de leche! These look amazing! Crunchy meringue with gorgeous (and always, I find, totally irresistible) dulce de leche. Yum. Kim, chocolate would definitely work. Nuts and chocolate are always great together. Dolce, I’m not familiar but should try to get acquainted. 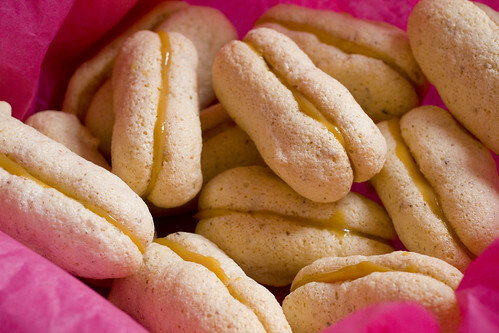 These look so light and airy and so good with the dulce de leche filling! Your meringue cookies are delightful! I just happen to have some leftover dulce de leche as I just made cupcakes with it. Fabulous combination!